One of the hardest things about being an author is putting myself out there. It goes against every self-protective gene in my body. Not to mention coughing up a big loogey on my mother’s manners curriculum. Today, I’m over on a fellow author’s blog. She’s someone I admire. I have fan-girled over her books on this blog. Because of that, she’s asked me to read the next book in her young adult science fiction series and it’s a pulse-pounder. I’ve also been privy to a book she’s begun marketing that’s written for adults. I’m happy to give her partial credit for my acceptance in the anthology she’s helping me promote today. She read the first chapter and shredded it. When I sent her the rewritten scene, she praised it. Talk about making a writer feel pretty good. But I’m getting off the topic. There’s two ways that putting myself out there is most difficult. Some of the stories I write are turned out in days for a specific reason. Although there is an element of “me” in them, my heart isn’t fully vested. A novel that has taken months to write, rewrite, revise and edit? There’s a huge investment of my heart, soul and mind on those pages. And then the agent rejects them. The publisher criticizes the story line. Readers rip on the characters in a review. Because if they aren’t bubbling over about it, the words that will answer that inquiry will wound me. Even if they’re spoken kindly. Isn’t she lovely? And on sale until the end of the year. Okay, I don’t think I really ever brag about my books. But I do post links on social media so people can buy them. I run ads. I carry boxes in my car. I’m eager to make a sale. And not for the money. But so I can return to the position mentioned under number one. Because I want my story to burrow into the hearts and minds of readers. If I had a dozen real fans (meaning they aren’t related to me and probably have never met me in person), I would hyperventilate. A dozen? That’s how pathetic I am. Because all the big indie book marketers know you need 1000 readers to have a “successful” book. And your inner circle of dedicated fans should be at least 100 so they will make your next book release amazing. After all, hitting high rankings on Amazon is what it’s all about, right? And that’s why putting myself out there still feels like walking naked on the stage at high school graduation (not that I KNOW how that feels). So, if you can give Jennifer a little love today by clicking through and leaving a comment on her blog, that would be like dropping a robe over my shoulders. If you shared this post with your group of friends on Facebook or Google, this writer couldn’t get more fully clothed. Have you ever put yourself out there? What was hardest about it? There are books on the process of writing a novel. Entire websites are dedicated to the subject. And none of them suggest doing it the way I’m about to demonstrate. As I move through the process, the reason for that will become abundantly clear. In fact, multiple reasons for avoiding my novel way of writing a novel will flash like neon warnings. I’ve been working on a short story project since March. I’ve alluded to it several times in posts here or updates on Facebook. However, even though I have a signed contract, I was sworn to secrecy. It was my Top Secret project. As I pen these words, I still haven’t been given the go ahead to announce the project or my participation therein. What was supposed to have an October 2015 publishing date has been pushed back to February 2016. The repercussions of a story I wrote specifically to submit to this secret project ring like aftershocks in my writing world. In a world where I sent queries into the depths of cyberspace, pleading for a chance to send my fully written, revised, edited and proofed novel for their reading enjoyment, that simple sentence knocked me for a loop. I would have been crazy to shrug off this opportunity. So, I sent a cautious reply to my editor. And the email correspondence continued for another week. “To retain threads of time, theme, characters in the short story and throw out ideas that can be explored further” in a novel-length work. Does anyone go about building a story this way? Isn’t the seed usually for a premise or concept, or maybe a character or problem? And there were plenty of lee lines hanging around in my short story. In fact, my main character had something like a heavenly directive given to him in the resolution of the 9000-word experience (otherwise known as short fiction). So, rather than outlining his complete story, I was supposed to brainstorm possibilities for what happened afterward. Yeah, I scribbled out three full notebook pages without pause. But how can I organize these tidbits into something compelling enough to convince this publisher she wants the story? The initial deadline to share my visions of where the story might go (after it ends in the short story bought and to-be-published) was given. I have an idea factory inside my brain. Every fiction writer I know has something similar. The slightest thing becomes a seed for a full-blown tale. The same was true for the universe I imagined in detail as the setting of this short story. So the scribbles continued. First, I guessed I had enough for a four-book series. On closer thought, I condensed it into a trilogy. But the stakes and the ticking clock needed for the first installment still seemed a little week. And wait! Am I even supposed to be planning this stuff? The ten points that are due …the clock is ticking on that…don’t have to outline a complete story. Shouldn’t I have sighed with relief? Instead, frustration mounted. I seriously didn’t know how to pitch on incomplete story idea. Should I focus on a few premises? Let the publisher take her pick? Those original three handwritten pages were a drop in the bucket. I expanded the 500-word history I’d written for my setting into a nearly 3000-word history. I laid out the different sub-sections of the war-torn country. I gave each of them inhabitants and a governing style and leaders. Now there were people for my hero to meet on his journey. And so I filled more notebook pages with descriptions of the people and their problems. I listed possible conflicts that would arise when my hero encountered those systems. And it still looks like a trilogy in the making or one FAT novel (not the preference for YA readers). But I didn’t know what to include in the requested outline. So I called on my fabulous editor. When it was all said and done, written down in sparkling clean fashion and emailed to the publisher, the waiting began. Sometimes it feels like writing is more about waiting than it is about transcribing pretty words on a page to form cool adventures. 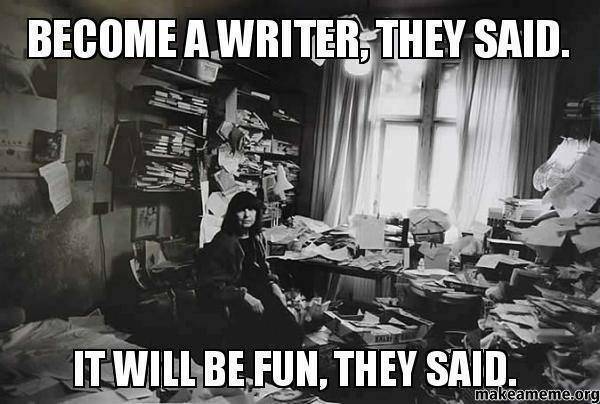 Are you writing a novel? If you’re nodding yes, don’t follow this plan. Seriously. Sometimes I avoid reading a book because I think the subject matter is wrong for me. That was the case with The Artisans by Julie Reece. It was reviewed as a ghost story. First of all, horror movies are not for me. I will have nightmares for weeks. The same goes for scary books (because my imagination is every bit as good as Hollywood’s best special effects). So even though I heard great things about this book – and interact with the author in an online critique group, I avoided reading it. Then it went on sale for $3. Yep. I couldn’t avoid the impulse purchase. And after finishing the book this morning, I’m not at all sad to have caved in to my baser need for books. I only wish I had snapped the thing up when it first released into print. Raven’s stepfather’s in trouble. His alcohol problem has led to a gambling debt and getting on the nerves of the powerful Maddox family. To get him the help he needs, she agrees to live with and work for Gideon Maddox. She thinks she’d in danger from Gideon, but she soon discovers things are not all peaceful and serene in the enormous mansion where she lives and works. While her heart fights attraction to the complex master of the house, ghosts from the past make her fight for her very life. This is a modern retelling of Beauty and the Beast with a paranormal twist. I’m not a fan of ghost stories. Did I already say that? Sorry. To reiterate, I don’t read ghost stories. If they don’t make me have nightmares, they make my eyes roll in disbelief. I read to immerse myself in a different world. Why would I read something that constantly kicked me back to reality because it was unbelievable? That is not Ms. Reece’s ghost story. She has a plausible explanation and resolution for the spirits haunting the pages of this young adult romance. I adore Raven. From the first page to the last, I wanted her to succeed. Her backstory was complex and well-constructed and her personality had just enough contradiction to keep her believable. I loved the banter between Raven and her two friends. Although they were minor characters, her friends were well-drawn. No cardboard cutouts here. Although Ms. Reece did a fine job making Gideon likable, I still had trouble seeing past his veneer. Of course, that works for the first part of the story. He won me over when he chased after Raven. Seriously, I hate when guys let the girl of their dreams walk out. The magical element – why Raven could see and hear the ghosts when no one else could – was never explained. This bummed me out a little, but didn’t keep me from loving the story. If you love quirky teenage heroines, you want to read this story. If you like a little bit of ghost with your romance, you’ll find this book worth every moment you spend in its pages. Hot guys? Yep, that’s here. Laughter and tears? Another yes. A book that’s hard to put down? Oh, yeah. If you’re an adult, you’ll enjoy this book. The mystery and intrigue will keep you wondering. There isn’t too much angst and only a couple hot-and-heavy kisses. Don’t let the description of “Southern gothic horror” deter you if you’re not a big paranormal fan. Is it creepy in spots? Most definitely. And I refused to read it after dark on principle. But I could hardly wait for it to be daytime so I could start reading it again. Worth five stars in my book. In a non-parody of a comedic television show, let’s take a moment to investigate the ownership of a published work. Recently, this author has been pondering this oft-debated issue, and I’ve come up with four possibilities. One of the co-authors in the romance anthology Accidental Valentine posted on the topic July 16, 2015. Her points made me reconsider this whole notion that a story belongs to any one person. I hope you’ll take the time to read Wendy Sparrow’s post on this topic, as well as the comments (there were only two at the time of this writing). I won’t attempt to paraphrase what she says because I don’t want to twist her original meaning. And there is the crux of this issue for me. How can I know Shakespeare’s intended meaning a few hundred years after his death? If an author is still living, and of sound mind, I suppose we could interview them to find out what they meant. However, if we assume that words can take on a life of their own when formed into a story, is the original intention even the point? Those questions are to give you a hint how my brain arrived at the four possible owners of a story. (And I’m not talking about copyright issues because we have laws that clearly govern those.) Once a story is penned, published and consumed, does the story belong to the author, the readers, the literary community at large or the characters? Perhaps you have a fourth alternative. I hope you’ll share it in the comments. I would say authors pour heart and soul into whatever piece of fiction they’re working on. And creative non-fiction based on personal experiences takes an even bigger chunk. If the author holds back, the writing lacks authenticity. However, I can’t take full credit for any of the stories I’ve created. Something in the real world sparked the idea in my brain. It originated from that little seed. To grow it, I just kept expanding on the idea, asking “what if” until I had a solid story line. I agree with Sparrow in that I am a reader first. I love to write. I live to write (or is that I write for a living? ), but my first love is reading. Once an author releases a story into the world through publishing, it settles into the hearts and minds of readers. Some stories are in the mind only as long as it takes to read them. Others embed themselves deep in the heart, offering up reminders of characters whose attitudes and experiences shaped my own worldview. Do I write for readers? Yes. My stories are as much for them as it is for me. If I didn’t want to share it with someone, I wouldn’t. Does that mean I’ve relinquished ownership to them? What does that mean? Ownership, according to dictionary.com is “the state or fact of being a person who has or holds” some object. Ownership implies possession. If I possess it, it is mine. Once I publish the story, I have consented to share its ownership. By making it available for public consumption, I’m sharing my creation. It’s like baking a cake. Everyone who consumes a part of the cake becomes owner of its deliciousness. I can’t take it back. It’s in them. The same with written words. Once they are consumed, they become part of the consumer. That story is now part of the reader. It might go out as quickly as the cake. Or it might stay around for awhile (like the fat on my waistline from all the cake I’ve consumed over the years). Once a book is published, it’s fodder for the public. One major voice in this realm is the literary community. You know who I mean, the professors at universities and English teachers at every level. In her post, Sparrow cited some literary figure and his theory on “The Death of an Author” (read more here if you’re interested). He’s one of many who believes if an author didn’t infer or state something in the text, it shouldn’t be later implied to be there. Can we hear professors of literature everywhere sobbing? Let’s face it, stories – especially fiction – are subjective. Each of us interpret the text through the stained glass of our own experiences. And the author did the same while they wrote it. Can a story mean more than one thing? Certainly. It can live a thousand lives in the heart or mind of anyone who reads it and gleans meaning from it. This is where my mind went after I read Sparrow’s post. I might have birthed the story. In fact, I know I labored hard to perfect it on the page. It’s my baby. Or, I should say, it’s about a bunch of my babies. I’ve given them life by writing their story down and sharing it with others. “Dream Architect” is whose story? Ashlin’s and Dylan’s. I told their story and submitted it to a publisher. The publisher liked it and bought the first American publishing rights to it. (So maybe the publisher is the owner of the story-for three years anyway.) Readers consumed the story. But the story is about Ashlin and Dylan. It belongs to them. They lived it (as much as a fictional character can). They experienced the accidental encounter and the turmoil that followed. I wrote their experiences down and readers learned about them through reading, but the story is Ashlin’s and Dylan’s. What do you think? Does a story have a single owner (possessor)? Do all of these people share in ownership of a story? Imagine my surprise when I won a physical, hardbound copy of a book just for sharing a Tweet. That book, Hexed, will now be subjected to my non-paranormal reviewing powers. Before I begin, I’d like to give a shout out to Adriann Ranta of Wolf Literary for promptly mailing out the book. She’s doing a great job representing Ms. Krys, getting her first book into the hands of readers as the second book is being released. You’re ready for more now, too, right? Even if you aren’t a fan of paranormal stories starring witches and sorcerers (Harry Potter books excluded, of course). Indigo Blackwood seems to be the typical snobby cheerleader at the beginning of the series (think Mean Girls). Her best friend is the head cheerleader and treats Indigo poorly because she’s jealous of her 8-month relationship with the quarterback of the football team. Sounds cliché, right? I mean cheerleader dating quarterback with a mean girl head cheerleader antagonizing things. That’s been done a million times. Not like Krys does it. Indigo’s mom is a member of a Wiccan society and owns a witchcraft shop. Indigo things she might be crazy because her mom has been known to bury books in the back yard – digging with her own two hands. Actually, she’s paranoid about only one book, The Witch Hunter’s Bible. Not that Indigo believes there are such things as witches. All that changes as a series of events throws Indigo into danger. A handsome stranger stalks her, until she realizes he’s trying to help. Aside from the theft of the book and further terrorizing at the hands of the sorcerer group, The Priory, Indigo faces the teenage torture of walking in on her boyfriend and best friend. Finally, Indigo accepts that she might be a witch and struggles to learn her powers. After all, she’s tired of being everyone’s victim. Indigo Blackwood won my heart. Her thoughts, actions and commentary remains true to the character of a junior in high school. This first person narration does the genre and mode proud. This alone earned the story a strong 4.6 out of five stars. I appreciated that Indigo never really mastered her emotions. What teenage girl can? Maybe for ten minutes. This also helped the story ring true. And allowed for more conflict and tension because readers realized she would run straight into the arms of trouble unprepared. The minor characters of Paige and Bishop were well-drawn, as well. Of course, we only get to see them from Indigo’s perspective, and she isn’t an unbiased observer. Paige is the unpopular next door neighbor who comes through as a true friend (more cliché). Bishop is an orphan warlock (male counterpart of witch in this series whereas Potter had wizards) with plenty of secrets of his own. It was difficult to put this book down. I ended up reading it on three consecutive evenings. By the last 100 pages, there was no chance I would stop reading until I finished. I don’t spoil stories with my reviews. Suffice it to say there are several wrenching twists that are unexpected. However, they aren’t unbelievable or unsupported. There are more bad guys in this story than good. We get the impression we’re supposed to side with the witches, but their ruling body, The Family, doesn’t win my adoration. If you prefer an obvious black and white in your good and evil battles, this book won’t give you that. As in life, plans never go as planned. Indigo loses more than she gains. The ending is happy – sort of. My least favorite thing about the book was the fact that the resolution included the set-up for the next book in the series. It was done well, not coming off as a cliffhanger. If you don’t want to bite, just don’t read the Epilogue. While this book has several hundred reviews on Goodreads, it earns less than four stars overall there. There are only eight reviews on Amazon with a 4.2 out of five-star rating overall. Teenager girls and women readers of YA fiction will enjoy this book. Not a fan of paranormal? This book doesn’t try to explain the magic or give a history of it, which made it easier for me to accept. There is murder, blood, gore, and disturbing images. It doesn’t have the gut-wrenching suspense of a thriller, however, and was too believable to read like horror. Since it didn’t give me nightmares, I’d say it is PG-13 rather than something heavier. Because I like Indigo, I will be reading the sequel, Charmed. Currently, the Kindle edition is going for $1.99, and I’m all about that good deal. Have you read Hexed? What did you think? Is paranormal still as “in” as it has been the past several years?